Superb, Fourseasons, fabulous interesting colours! What a great place to sit and enjoy everything! is this a Botanical Garden.Its soo perfect and nice.? No, Eckie, this is just a private garden measuring approximately one third of an acre (178 foot long and 52 foot wide). My husband and I share a passion for gardening - which is helpful! With the time, energy and money involved, it has to be a joint venture. We will both be retiring by the end of next year, so we will have more time but less money!!! With both of us working full time, it's been a frantic year with 7 open days and 7 days of filming so far for BBC Gardeners' World. Next year we are planning 10 open days, starting in February - the depth of our winter, and finishing in October - when it will be mid autumn. WOW!!! The best sloping border I have ever seen. How did you do that? I am only a beginner, oh it is soooo lovely. The border is in terraces supported by large rocks. The colourful flowers are begonias and they are in containers of one, two or three tiers. We can quickly remove them in the autumn and store the corms for the winter. Without the containers of flowers we can then appreciate the changing leaf colours of the acers and azaleas. In the spring we have lots of azalea colour and supplement that with pots of daffodils and tulips which, again, we can move when they are over their best. We store them in a corner of the garden out of the way so that the leaves can die down naturally. I am so jealous - I am a novice gardener and am trying to learn through trial and error. I find mistakes can be very expensive. This year I am buying more perenials and shrubs to save having to buy so many bedding plants every year. Thank you all for your kind comments. We've been rather hectic recently - but things should quieten down - we both retired this week! Would not know where to even start! I bow down to your gardening expertise! We are very honoured that the national garden scheme selected a photo of almost exactly this view of our garden in spring for their 2010 Yellow Book. It is the back ground photo on the "Welcome to The Yellow Book" page. Amazing garden, id just love it. How do you stop the weeds from appearing? We don't tolerate weeds! One year's seeding - 7 years weeding. When one pokes its head up we winkle it out. Some are masters of disguise but we spot them in the end. We do put a layer of chunky forest bark on the borders - but that doesn't stop perennial weeds such as dandelions - these have to be rooted out beforehand. 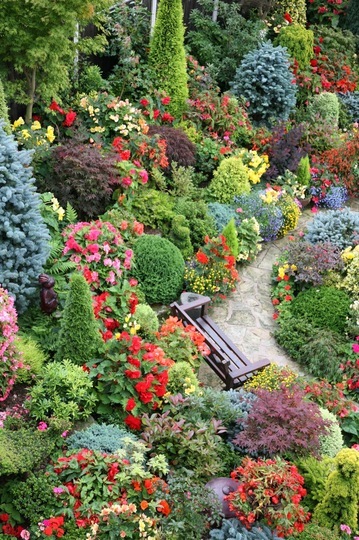 I've never seen a garden as exquisite as this before. What can I say as I cannot find a superlative that hasn't been said before regarding your much to be envied kaleisoscope of colour.How I wish I could come to see it. Sorry this is my comment on fourseasons garden. It will be an interesting summer this year. Having retired 18 months ago, last year we had 13 open days and our daughter's wedding reception marquee in the garden. This year is our first opportunity to really have a break. We have reduced our open days down from 13 throughout the year to just 4 in May. May was stunning with azalea colour and we welcomed 740 visitors over the two weekends and raised £2,250 for charity. Having successfully over-wintered the begonias, for this summer we will have just a few pots of them dotted about. It will be interesting to see the summer garden when it will be mainly colour from acers and conifers foliage.